← Fontanavigna, Pallagrello Bianco, Terre del Principe, Terre del Volturno, Castel Campagnano, Campania, IGT, Italy, 2011, 13.5% abv. 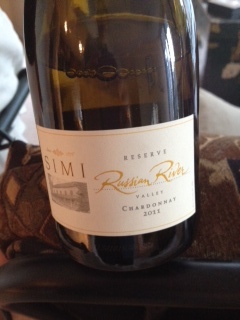 Simi, Chardonnay, Russian River Valley, California, 2005, 15.5% abv. Start with two wine geeks – one with a broken finger suffered on a recent trip at the Simi winery and one with extreme WSET pre-exam stress. Throw in a Friday evening and three bottles of Simi Russian River Valley Chardonnay from 2011, 2010 and 2005 and all of a sudden you have two very relaxed wine geeks and a small party. Three bottles? Well, we started out with honourable intentions, only intending to open one. Okay, maybe two. Marta had acquired these bottles because she had been at Simi with a group but someone had inadvertently closed the van door on her finger thwarting her in the parking lot from attending the master tasting. Not to worry though as not only was the local emergency room incredibly efficient, Simi kindly donated the three bottles to her recuperation plan. The Simi winery has been around in Sonoma County since 1876 when it was established by two brothers who’d immigrated from Tuscany. They stopped producing everything except sacramental wines during Prohibition, but are considered to be the longest running winery in California. They have a solid reputation for good quality wines; you always know you are getting something of value for your dollar when you open a bottle of Simi. The first bottle (2011 and 14.5% abv) was medium lemon with legs and the nose, clean and youthful with medium plus intense aromas of lemon drop, pomelo and yellow grapefruit with minerals. The palate was dry with good acidity and high, but integrated alcohol, pomelo and yellow apple flavours. Youthful, fruity and the lightest of the bunch, we were intrigued. On to bottle two. Number two (a 2010 Reserve and 14.5% abv) was a deeper medium gold with heavier legs. The nose was clean and youthful with medium intense aromas of minerals, more pomelo but with white grapefruit rind and lemon drop. Hints of caramel and vanilla with yellow apple augmented the aromas. Dry with medium plus acidity and high but integrated alcohol, the body was full with intense flavors of salted caramel, yellow apple, white grapefruit and pomelo with vanilla and a long finish. WSET Very Good with lovely integration and some complexity. But bottle number three really hit home. This was the 2005 with a very high 15.5% abv and aged in oak for 6 months prior to bottling. With its deep gold colour and viscous legs, it was clean and developing with medium plus intensity and aromas of ripe yellow and red apple, deep baking spice, clove, vanilla, hazelnuts, caramel and toast. The palate was dry with juicy acidity and high alcohol with full body. Flavours echoed the nose with more apples, baking spices, clove and vanilla, nutmeg, toast and a yeasty-sherry flavour complete with a salty toffee kick. There were 19,260 bottles of this beauty created in 2005. It has proven its longevity with its acidity, fruit, development and integration. Complex and concentrated with a long finish, it’s WSET Very Good. This entry was posted in California, Chardonnay, OTHER, WHITE and tagged california, chardonnay, russian river, Russian River Valley, simi, Simi 2010 Reserve Chardonnay, Simi 2011 Chardonnay, Simi Chardonnay 2005, Sonoma County, white wine. Bookmark the permalink. 6 Responses to Simi, Chardonnay, Russian River Valley, California, 2005, 15.5% abv. Should be mentioned that bottle number 1 was not full. There was a mere glass each left in it. We’re not complete lushes. Just wine professionals. Dear Winellama. Is it possible that by bottle number three, that slightly aged grape Koolaid also would have scored a “Very Good” rating?